Mark Cuban on podcasting. Smart guy. Right on. Kosso: "There is now a Flickr Missing Persons group for people missing after the attacks in London yesterday." 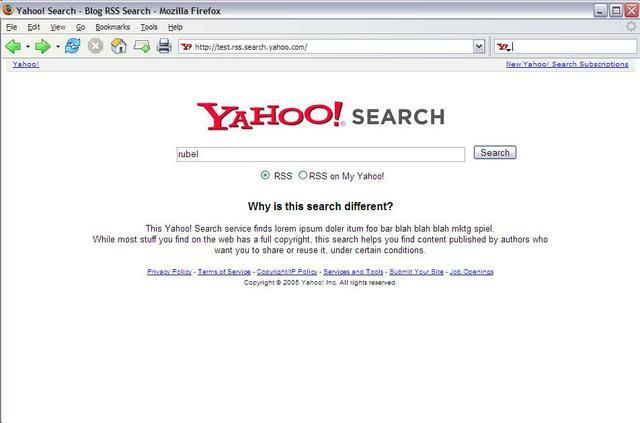 Steve Rubel found a RSS search tool on Yahoo. It's offline now, good thing Steve took a couple of screen shots. Could be a new competitor for Feedster, PubSub & Technorati. Brent Simmons's comments on the OPML Editor, which he did indeed play a big role in implementing, long before NetNewsWire. After Boston, I'm going to look for a nice spot with Internet access and a nearby lake, either in New England or Canada, where I can spend two weeks creating a public release of the OPML Editor. It's time. Of course when it's released it will still need fixes and new features, but it will also have a very convenient update mechanism. Let's add another topic to Tuesday's meetup in NYC. Got a podcasting question you want to talk about? Bring it with you on Tuesday. Several people have asked if you need to RSVP, and what about security. So far as I know you don't need to RSVP, and the security people in the building lobby will know about the meetup. Steve Garfield is hosting a Meet The Vloggers thing at the Apple Store in Soho tonight at 6PM. Rebecca MacKinnon samples the Muslim blogosphere reaction to yesterday's London bombings. ABC News Online has created an interactive map of the scene of the London bombings for the Google Earth software. Audiofile is "the magazine for people who love audiobooks." This movie is still really funny. Last update: Friday, July 08, 2005 at 2:38 PM Eastern.